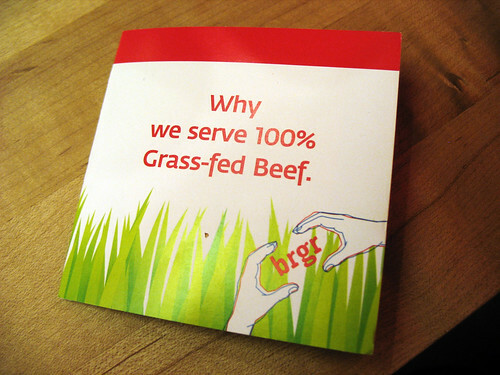 Although BRGR serves a veggie burger, their restaurant is full of pamphlets and propaganda about the merits of grass-fed beef, which made me feel kind of uncomfortable as a vegetarian. This is definitely one of those burger joints where the veggie burger is the ugly stepchild on the menu. And it is another place with that “build your own” option as well as menu suggestions. I went with the “cultivated garden burger” – their suggested veggie burger combination, because I assume that this is the way a restaurant believes their burger is best showcased, and I like to give them a chance to show me their veggie burger at its best! The friendly cashier told me they had just switched over to using a new kind of veggie patty – she knew for sure that it was vegan, but couldn’t tell me whether the bun it is served on contained dairy or not. I feel like, even though I’m not even vegan myself, I am constantly educating people on the difference between vegan and vegetarian because I sincerely want to make this blog a useful resource for veggie burger lovers of all kinds. And inevitably I encounter a lot of restaurant employees who have never even considered the fact that bread often contains dairy. To be fair, I didn’t think about that myself until I lived with some vegans in college. 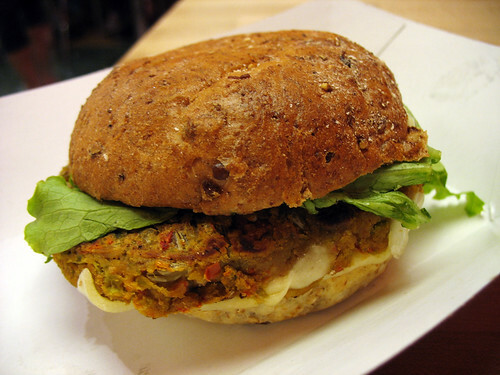 A lot of restaurants seem proud to announce that their burger is vegan, because the patty is free of animal products. But then they hesitate and admit that they aren’t sure about the ingredients in the bread. Vegans aside, with the number of lactose-intolerant people in the world, I find this pretty shocking! 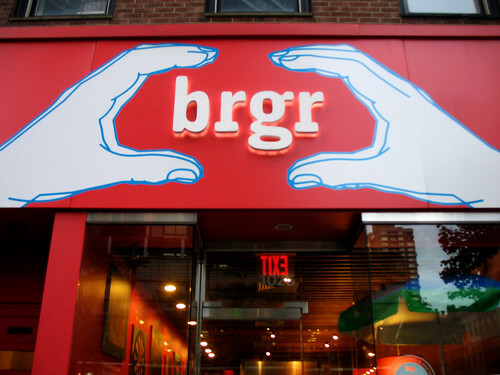 And at BRGR in particular, because their whole shtick is “grass-fed beef”, this lack of knowledge about ingredients seems hypocritical (or I guess it only applies to meat?). 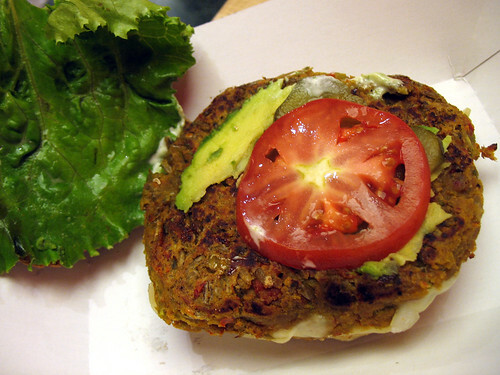 The patty was very hearty, chock full of seeds and grains, along with peppers, peas, and that familiar soy-based texture. There was a tanginess to it that I couldn’t quite place. I wish it had been a bit firmer or crispier, overall it was just too mushy to impress me. The default toppings from the menu included gruyere cheese, avocado, pickles, lettuce, tomato, and mayo. The cheese was more rubbery than melty and gooey, and I felt cheated by the couple of sad-looking small pieces of avocado. The herbed mayo was quite good, but its taste competed with that of the pickles, and I think I would have preferred just the pickles. The bun said wheat, but it was too light-colored to be whole wheat. Very soft, and fresh (points for that! ), sprinkled with seeds. It would have actually been more delicious on its own with just a bit of butter, rather than a burger. The sweetness of it was nice, but not a good match for the tangier, more savory flavors of the burger. I think this is my new favorite veggie burger photo, what a wonder colored backgrounds can do! The vegan burger/non-vegan bun thing happens ALL THE TIME. I cannot figure out why restaurants even bother with a vegan patty if they fail on the bun. So lame. I'm totally with you on the mushy thing. 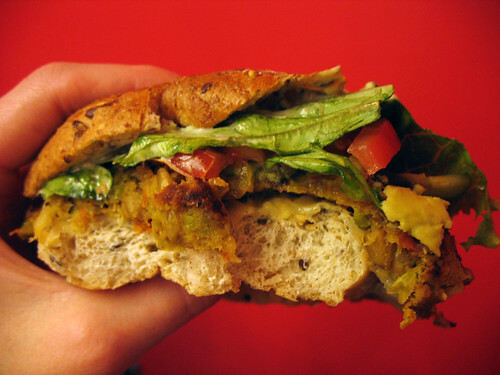 Anytime I get a mushy veggie burger, that is a deal breaker for me. Some of the falafel style ones start out nice, with a crisp exterior and then you get to the inside and ... mush!